Frederick M. Irish served as the first head football coach at the Territorial Normal School, renamed Tempe Normal School in 1903 and now known as Arizona State University, coaching from 1896 to 1906 and compiling a record of 12–8. Territorial Normal did not field a football team in 1897, 1898, or 1901. George Schaeffer served as the head football coach at Tempe Normal School from 1914 to 1916, compiling a record of 7–8. Aaron McCreary oversaw the school's football program from 1923–1929. During this time, the school changed its nickname from the Owls to the Bulldogs and the name of the school was changed to Arizona State University. McCreary left ASU with a 25–17–4 record. Ted Shipkey led the Arizona State football program from 1930–1932, compiling a record of 13–10–2. Shipkey was replaced by Rudy Lavik, who led Arizona State to a less impressive 13–26–3 mark in his five seasons. Dixie Howell served as ASU's head coach from 1938 to 1941, compiling a record of 23–15–4. In 1947, Ed Doherty became head coach at Arizona State, where he compiled a 25–17 record from 1947 to 1950. He left after ASU five days after defeating rival Arizona, 47–13, because he felt that he didn't have enough job security. Clyde Smith took over the reins of the Arizona State football program in 1952, and under his leadership, they compiled a record of 15–13–1. Smith resigned following the 1954 season. On February 5, 1955, Michigan State assistant coach Dan Devine accepted the head coaching position at Arizona State. Joining him as an assistant was Frank Kush, who would have even greater success at the school after Devine's departure. During his three years, Devine compiled a record of 27–3–1 (.887), including a spotless 10–0 mark during his final campaign. In that last season, Devine's team led the nation in total offense and scoring, averaging just under 40 points per game in the latter category. Devine's success at Arizona State resulted in an offer from Missouri, which he accepted on December 18, 1957. Frank Kush was promoted to the position of head coach at Arizona State, which he would hold for the next 22 years. During his time at Arizona State, Kush was known for being one of the most physically demanding coaches in the game. His daily football practices in the heat of the Arizona desert are still the stuff of legend today. One of his drills was known as "Bull in the Ring", whereupon he would have the players form a circle. He would put a player in the middle (most often, a player he felt needed "motivation"), call out a uniform number, and blow his whistle. That player would charge the player in the middle and the two would engage in contact until Kush blew the whistle again. Whichever of the two players gave the best effort would go back to the circle, while the player "dogging it" would stay in until Kush decided he could quit. Former NFL and Arizona State player Curley Culp once broke a teammate's facemask during this drill. Another of his drills (which was designed to see if his running backs could take punishment carrying the ball) consisted of having only a center, quarterback, and two running backs line up on offense, with no other offensive lineman, and run running plays against the entire defense. Kush would run a running back into the line time and time again so he could get used to the pounding he would take in games. The most famous of Kush's motivational techniques was called "Mount Kush." Mount Kush was a steep hill near the Sun Devils' practice facility (Camp Tontozona) near Payson, Arizona with several large rocks, cacti, and no shade from the Arizona sun. If a player especially needed discipline in Kush's opinion, that player would have to run up and down that hill numerous times. During his lengthy career in the desert, Kush compiled a record of 176–54–1, with only one losing season. In his first eleven years, he captured two conference titles and finished runnerup five times. That success led to him accepting the head coaching job at the University of Pittsburgh on January 4, 1969. However, just five days later, Kush had a change of heart and returned to Arizona State. Kush's return would begin a memorable era in Sun Devil football history with five consecutive Western Athletic Conference championships as the team won 50 of 56 games from 1969 to 1973. During this time, Arizona State won the 1970 Peach Bowl and the first three editions of the Fiesta Bowl. In 1974, the team dropped to 7–4, but bounced back with authority the following year when they went 12–0, capping the year with a thrilling 17–14 win over the Nebraska Cornhuskers in the Fiesta Bowl, a game in which Kush's son, Danny, kicked three field goals, including the game winner. A down year in 1976 saw the team fall to 4–7, but another comeback resulted the next year with a 9–3 mark. In that year's Fiesta Bowl, the Sun Devils lost a bowl game for the only time under Kush's leadership, with a 42–30 defeat to Penn State. In 1978, Kush's team once again finished 9–3, this time defeating Rutgers in the Garden State Bowl. That win would be one of the final highlights of Kush's tenure as controversy and scandal the next year toppled him from his head coaching position. In September 1979 former Sun Devil punter Kevin Rutledge filed a $1.1 million lawsuit against the school, accusing Kush and his staff of mental and physical harassment that forced him to transfer. The most dramatic charge was that Kush had punched Rutledge in the mouth after a bad punt in the October 28, 1978, game against the Washington Huskies. During the next few weeks, overzealous fans turned things ugly when the insurance office of Rutledge's father suffered a fire and the family's attorney received two death threats. On October 13, 1979, Kush was fired as head coach for interfering with the school's internal investigation into Rutledge's allegations. Athletic director Fred Miller cited Kush's alleged attempts to pressure players and coaches into keeping quiet. The decision came just three hours before the team's home game against Washington. Kush was allowed to coach the game, with the Sun Devils pulling off an emotional 12–7 upset of the sixth-ranked Huskies, fueled by the angry crowd incensed by the decision. After the game ended, Kush was carried off the field by his team. The win gave him a 3–2 record on the season, but all three victories were later forfeited when it was determined that Arizona State had used ineligible players. After nearly two years, Kush would be found not liable in the case, but would be off the sidelines during 1980, the first time in more than 30 years that he had been away from the game. The case itself would have far-reaching implications for coaches everywhere, making them consider the different ways to best motivate and/or punish players. Future NFL players who played under Kush at Arizona State include Charley Taylor, Curley Culp, Danny White, Benny Malone, Mike Haynes, and John Jefferson and Steve Holden. Baseball Hall of Famer Reggie Jackson also played a year of football at Arizona State for Kush on a football scholarship before switching to baseball. Darryl Rogers replaced Kush and led the Sun Devils to a 37–18–1 record in five seasons. The best season of the Rogers era came in 1982, a 10–2 campaign that resulted in a Fiesta Bowl win and a #6 ranking in the final AP and Coaches' polls. Rogers accepted an offer to serve as head coach of the NFL's Detroit Lions and left ASU after the 1984 season. John Cooper left his post as Tulsa head coach and became the head coach at Arizona State in 1985 where his teams played in three consecutive bowl games, including the 1987 Rose Bowl, during his three-year tenure. Notably, he was just 0–2–1 against arch-rival Arizona. He accepted the job as head coach at Ohio State on December 31, 1987. The 1986 team won the school's first Pacific-10 Championship and went on to defeat the Michigan Wolverines in the 1987 Rose Bowl. ASU promoted Larry Marmie from defensive coordinator to head coach to replace Cooper. Marmie's tenure was marked by mediocrity and disappointment, with a 6–5 mark in 1988, a 6–4–1 record in 1989, a 4–7 campaign in 1990, and a 6–5 season in 1991. School administrators fired Marmie following the 1991 season, amidst fan impatience. Bruce Snyder left California to become ASU's head coach in 1992. Snyder's 58 wins and nine-year tenure as head coach at Arizona State each rank second in school history to marks set by Frank Kush. Snyder led ASU to four bowl games including a win in the 1997 Sun Bowl. More than 40 ASU players coached by Snyder were selected in the National Football League Draft, including seven in the first round, and more than 40 others signed free agent contracts in the National Football League. In 1996, Snyder led the Sun Devils to one of the finest seasons in school history and was named Pacific-10 Coach of the Year. The 1996 squad finished with an 11–1 record and captured the Pacific-10 championship. The Sun Devils stunned the top-ranked and two-time defending national champion Nebraska Cornhuskers in the season's second game. Arizona State reeled off the third undefeated regular season in school history en route 1997 Rose Bowl, where they came within 19 seconds of a victory over Ohio State. Had they won, the Sun Devils would have likely won at least a share of the national championship, as they would have been the only undefeated major-conference team in the nation. For his efforts that season, Snyder won a number of national coaching awards, including the Paul "Bear" Bryant Award and the Walter Camp Coach of the Year Award. Snyder stepped down as ASU head coach following the 2000 season. Boise State head coach Dirk Koetter was hired to replace Snyder in 2001. At Arizona State, Koetter compiled a 40–34 record and four Bowl appearances in six years. Under Koetter, who was also the offensive play caller, the Sun Devils became known for a vertical passing attack. On November 26, 2006, Koetter was terminated as the head football coach. His final game was the 2006 Hawaii Bowl on Christmas Eve, a 41–24 loss. Seasoned coaching veteran Dennis Erickson left Idaho for the opportunity to lead his fourth BCS program. Athletic director Lisa Love hired him on December 9 to replace the recently fired Dirk Koetter. Arizona State was Erickson's third head coaching stint in the Pacific-10, after Washington State and Oregon State. In addition to Idaho, Erickson also had college head coaching tenures at Wyoming and Miami, as well as in the NFL with the Seattle Seahawks and San Francisco 49ers. Arizona State paid $2.8 million to Koetter and a $150,000 buyout to Idaho to complete the hiring of Erickson to a five-year contract. He immediately paid dividends for ASU, leading the Sun Devils to a 10–2 regular season record in 2007, a share of the Pacific-10 title, and a berth in the Holiday Bowl. Erickson was named the 2007 Pacific-10 Coach of the Year, becoming the first to ever win the award at three different Pacific-10 schools. He also coached another major award winner; placekicker Thomas Weber was named the Lou Groza Award winner. Erickson worked for the relatively low salary of $500,000 from ASU in his first season, with another $2 million paid by the 49ers for the last year of his NFL contract. The remaining four years of the original ASU contract paid $1.275 million per year. In 2008 the Arizona Board of Regents had approved a contract extension to keep Erickson at Arizona State through June 2012. Todd Graham was announced as Arizona State University's head coach on December 14, 2011. Graham came to ASU after only one season at Pittsburgh, informing his players and assistant coaches of his decision to leave Pitt for ASU via text message. Graham also previously served as head coach at Rice for one season and Tulsa for four seasons. In his first season at Arizona State, the Sun Devils went 8–5 securing their first winning season since 2007. With a win in the Kraft Fight Hunger Bowl against the Navy Midshipmen, the 2012 Sun Devils won the final three games of the season for the first time since 1978. ESPN's Pac-12 Blog writer Ted Miller called Todd Graham's first season at Arizona State an "unquestioned success." In 2013, Graham continued to build positive momentum and led ASU the Pac-12 South title after defeating UCLA and rival Arizona. ASU finished the season 10-4 and ranked #21 in the AP Poll and #20 in the Coach's Poll. For his efforts in leading ASU to a Pac-12 South championship, Graham received the 2013 Pac-12 Coach of the Year Award. In 2014, ASU finished with yet another 10 win season by going 10–3 and ranking #12 in the final AP Poll and #14 in the final Coach's Poll. The season was capped off with Graham leading the Sun Devils to victory over Duke University in the Sun Bowl. The 2015 season saw a big drop off for the program as the Sun Devils finished a disappointing 6–7 with a 42–43 loss to the West Virginia Mountaineers in the Cactus Bowl. The trend continued into the next two seasons. The Sun Devils finished 2016 on a 6-game losing streak which culminated in a 5–7 record. 2017 would be Graham's final season. The team improved only slightly, finishing 7–6 with a Sun Bowl loss to North Carolina State, 31–52. Graham was fired on November 26, 2017 following a 7–5 regular season. On December 3, 2017, longtime NFL coach and ESPN analyst Herm Edwards was announced as the next head coach of the Sun Devils. ASU has been twice named national champions by NCAA-deemed "major selectors." Arizona State has won 17 conference championships, seven in the Border Conference, seven in the Western Athletic Conference, and three in the Pac-12 Conference. Arizona State has played in 31 bowl games in its history. The Sun Devils have a bowl record of 14–16–1. The Sun Devils play their home games at Frank Kush Field at Sun Devil Stadium in Tempe, Arizona. Sun Devil Stadium was constructed in 1958 and originally held a capacity of 30,000. On September 21, 1996, the playing surface was renamed Frank Kush Field after the long time ASU coach in a 19-0 upset of then top-ranked Nebraska. Colors – Arizona State's traditional colors are maroon and gold. Songs - The fight songs for Arizona State are "Maroon and Gold" and "Go Go Devils". After a touchdown "Maroon and Gold" is played. After a field goal "Go Go Devils" is played. For big plays, a shortened version of either song is played. Mascot – Arizona State's mascot is "Sparky the Sun Devil". Sparky was adopted as ASU's mascot in 1946 following a vote was held to replace the Bulldog, the mascot at the time. Devil Walk - Prior to each home game, fans and the Sun Devil Marching Band welcomes the team inside Wells Fargo Arena (Tempe) as they head to the football stadium. At the conclusion of the event, the marching band performs a short concert. Arizona State fields a 300+ member marching band that performs at all home football games, bowl games, and the rivalry game with the University of Arizona. In addition to half time shows and stand tunes, the Sun Devil Marching Band always play the Arizona State fight songs and the Alma Mater. Arizona State's longest and most intense rivalry is with the University of Arizona. The football game between the schools is nicknamed The Duel in the Desert, and the winner of the game receives the Territorial Cup. Arizona State won the first matchup in 1899 by a score of 11-2. Arizona holds the all-time series lead with a record of 49-40-1. ASU was not considered a "major school" until 1931, and since that year the series is tied at 38-38-1. Since becoming a university in 1958, Arizona State has the overall lead in the rivalry series with a record of 31-24-1. Since ASU and Arizona became Pac-12 Conference members in 1978, Arizona leads the series 19-16-1. In recent contests, an unranked Sun Devils team upset a ranked Arizona Wildcats team 30-29 in Tucson in 2010. After a strong start in 2011, ASU ended the season with a 31-27 loss to Arizona in Tempe. The Sun Devils finished the 2012 season with a win over the #24 ranked Wildcats in Tucson by a score of 41-34. In 2013, the #13 ranked Sun Devils beat the Wildcats 58-21 in Tempe. In 2014, the Wildcats hosted the game and beat the Sun Devils 42-35 to claim the Pac-12 South championship. Bill Kajikawa Practice Fields, located on Sixth Street and Rural Road, is normally where Sun Devil football team practices when weather permits. An Arizona State University property, is a 36-acre (150,000 m2) camp just outside Payson, Arizona created by former legendary coach Frank Kush was used as a bonding place for his players. Tontozona has marked the unofficial start of the Sun Devils' seasons from 1960–2008. Due to the knack of losing practices to rainouts, short and torn up fields leading to excessive injuries, and travel costs, the team decided to move camp back to Tempe campus with the arrival of the Devil Dome. After a 4-year absence the Sun Devils returned to Camp Tontozona starting in Aug 2012. The team was able to make the return after a short fund raising effort by fans and alumni brought in over $160,000. Formerly opened as Devil Dome and nicknamed,"The Bubble", $8.4 million practice facility broke ground on May 15, 2008 to provide a climate controlled space for the Sun Devil football team, Sun Devil Marching Band, ASU Intramurals and for other athletic department events. Before its full completion and turn over from the contractor to the university on the night of August 28, 2008 a powerful storm brought it down. The Bubble was re-inflated early October and was fully repaired for use in July 2009. During the 2009 season the facility was renamed and dedicated to generous donor Dr. Verde Dickey as the Verde Dickey Center, to not only commemorate his donation for the facility but also his donations to Sun Devil Marching Band and projects such as renovation of locker rooms in Wells Fargo Arena and Sun Devil Stadium, Weatherup Basketball Center, The Athletes Performance Center, John Spini Gymnastics Center, and wrestling practice facility. John Henry Johnson – Retired, Hall of Fame Running back, best known for being a part of the "Million Dollar Backfield"
^ "Arizona State University Art Sheet" (PDF). Arizona State University. February 17, 2012. Retrieved May 3, 2017. ^ "Arizona State Football History Database". www.nationalchamps.net. Retrieved March 25, 2017. ^ "All-Americans". www.thesundevils.com. Retrieved December 17, 2017. ^ "Tempe Normal School Records : 1885-1930 : Tempe Normal School Records". www.azarchivesonline.org. Retrieved December 17, 2017. ^ Eger, Bob (September 1, 2001). "Maroon & Gold: A History of Sun Devil Athletics". Sports Publishing LLC. Retrieved December 17, 2017 – via Google Books. ^ "Ted Shipkey Coaching Record - College Football at Sports-Reference.com". College Football at Sports-Reference.com. Retrieved December 17, 2017. ^ "All-Time Coaching Records by Year". www.cfbdatawarehouse.com. Retrieved December 17, 2017. ^ "Rudy Lavik Coaching Record - College Football at Sports-Reference.com". College Football at Sports-Reference.com. Retrieved December 17, 2017. ^ "Dixie Howell Coaching Record - College Football at Sports-Reference.com". College Football at Sports-Reference.com. Retrieved December 17, 2017. ^ "Tempe Coach Quits on Top -- No Security". The Washington Post. November 17, 1950. Retrieved December 14, 2010. ^ "Clyde Smith Coaching Record - College Football at Sports-Reference.com". College Football at Sports-Reference.com. Retrieved December 17, 2017. ^ "The Prescott Courier - Google News Archive Search". news.google.com. Retrieved December 17, 2017. ^ a b Litsky, Frank (May 10, 2002). "Dan Devine, Football Coach, Is Dead at 77". Retrieved December 17, 2017 – via NYTimes.com. ^ "Dan Devine Coaching Record - College Football at Sports-Reference.com". College Football at Sports-Reference.com. Retrieved December 17, 2017. ^ a b Perry, Dayn (2010). Reggie Jackson The Life and Thunderous Career of Baseball's Mr. October. HarperCollins. p. 18. ISBN 978-0-06-156238-9. ^ a b Reid, Ron. "There's The Devil To Pay," Sports Illustrated, October 29, 1979. ^ "Darryl Rogers Coaching Record - College Football at Sports-Reference.com". College Football at Sports-Reference.com. Retrieved December 17, 2017. 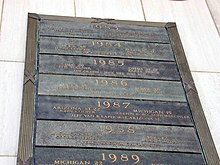 ^ "1982 Arizona State Sun Devils Schedule and Results - College Football at Sports-Reference.com". College Football at Sports-Reference.com. Retrieved December 17, 2017. ^ HARVEY, RANDY (September 25, 1985). "DARRYL ROGERS : In Tempe, He Could Not Hide Those Lion Ayes". Retrieved December 17, 2017 – via LA Times. ^ a b c "OhioStateBuckeyes.com : The Official Web Site of Ohio State Football". March 5, 2001. Retrieved December 17, 2017. ^ "Marmie Named Arizona State's Football Coach". January 6, 1988. Retrieved December 17, 2017 – via LA Times. ^ "1988 Arizona State Sun Devils Schedule and Results - College Football at Sports-Reference.com". College Football at Sports-Reference.com. Retrieved December 17, 2017. ^ "1989 Arizona State Sun Devils Schedule and Results - College Football at Sports-Reference.com". College Football at Sports-Reference.com. Retrieved December 17, 2017. ^ "1990 Arizona State Sun Devils Schedule and Results - College Football at Sports-Reference.com". College Football at Sports-Reference.com. Retrieved December 17, 2017. ^ "1991 Arizona State Sun Devils Schedule and Results - College Football at Sports-Reference.com". College Football at Sports-Reference.com. Retrieved December 17, 2017. ^ Press, From Associated (November 28, 1991). "Victory Over Arizona Doesn't Save Marmie's Job". Retrieved December 17, 2017 – via LA Times. ^ a b c d e "Former Arizona State coach Snyder dies at 69". ESPN.com. April 13, 2009. Retrieved December 17, 2017. ^ "Dirk Koetter Becomes 21st ASU Football Coach". Sun Devil Athletics. December 2, 2000. Archived from the original on February 13, 2016. Retrieved January 15, 2016. ^ "Dirk Koetter Coaching Record - College Football at Sports-Reference.com". College Football at Sports-Reference.com. Retrieved December 17, 2017. ^ Metcalfe, Jeff (November 26, 2006). "Koetter out as ASU football coach". The Arizona Republic. Retrieved April 7, 2011. ^ "Todd Graham Profile". Arizona State University. December 15, 2011. Retrieved September 14, 2012. ^ "Is Todd Graham the Most Hated Coach in America?". Retrieved December 17, 2017. ^ Haller, Doug (December 29, 2012). "ASU football routs Navy in the Kraft Fight Hunger Bowl". The Arizona Republic. Retrieved January 2, 2013. ^ "Pac-12 Power Rankings Week 14". ESPN. November 26, 2012. Retrieved November 27, 2012. ^ "Arizona State vs. UCLA - Game Recap - November 23, 2013 - ESPN". ESPN.com. Retrieved December 17, 2017. ^ "Arizona State vs. Duke - Box Score - December 27, 2014 - ESPN". ESPN.com. Retrieved December 17, 2017. ^ "Graham fired by ASU, hours after beating Zona". Retrieved December 17, 2017. ^ "ESPN's Herm Edwards hired as Arizona State coach". ESPN. December 3, 2017. Retrieved December 3, 2017. ^ National Collegiate Athletic Association (NCAA) (2017). "National Poll Rankings" (PDF). NCAA Division I FBS Football Records. NCAA. pp. 108–110, 113–114. Retrieved December 8, 2017. ^ "TheSunDevils.com - Arizona State University Athletics" (PDF). www.thesundevils.com. Retrieved March 28, 2018. ^ a b "Arizona State University Official Athletic Site – Facilities". TheSunDevils.com. Retrieved October 12, 2014. ^ "Arizona State Sun Devils". College Football at Sports-Reference.com. Retrieved October 12, 2014. ^ "Brief History of ASU". ^ Haller, Doug (May 12, 2012). "ASU football to return to Camp Tontozona August 14–18". AZ Central. ^ Morgan, Craig (May 31, 2012). "ASU announces return to Camp Tontozona". Fox Sports. ^ "ASU breaks ground on new indoor facility". ASU News. Archived from the original on October 9, 2013. Retrieved October 12, 2014. ^ "Storm damages ASU practice facility". Retrieved October 12, 2014. ^ "ASU's practice bubble now has a name". Retrieved October 12, 2014. ^ "Arizona State Sun Devils Football Schedules and Future Schedules". fbschedules.com. Retrieved September 2, 2012. Wikimedia Commons has media related to Arizona State Sun Devils football.